Not your ordinary hand and foot cream! A heavier version with organic shea butter, mango butter, and essential oils for hands, nails, and feet that need extra care. 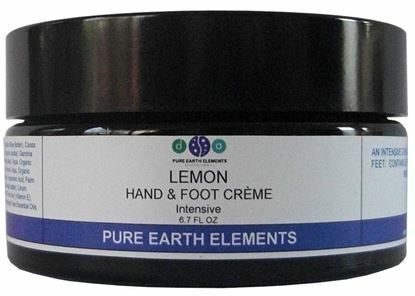 Lemon Hand & Foot Creme is an extra-rich, intensive cream made with organic shea butter, mango butter, and precious essential oils of lemon and myrrh. This is a must-have if your hands and feet are dry or rough. A rich, intensive shea butter hand and foot cream with beneficial essential oils of lemon and myrrh for extra-dry hands. NEW SIZE - 8 oz.